When it comes to soccer (or football, according to British English), every country has grounds for being the origin, since kicking a ball for sport has existed all around the world for a long time. For example, we can find early versions of soccer in ancient Rome and Greece, but the oldest evidence of it is found in China, in the second century B.C. Nonetheless, England has been the most influential country in establishing the idea of modern soccer, such that it is often called the birthplace of soccer. 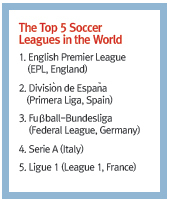 Being one of the top five leagues in the world, the English Premier League (henceforth, EPL) is the most profitable soccer league, has countless star players, and is also admired by tons of soccer fans everywhere. What makes the EPL so special? Why do so many people around the world love the league? 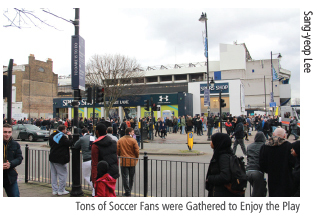 During two weeks of travel across England, The UOS Times tried to find out why by experiencing the local soccer culture in Britain. The EPL started in 1992. It has a rather short history considering that Bundesliga, the German soccer league, started in 1963, and Primera Liga, the Spanish league, started in 1929. However, the EPL grew rapidly, and now it overwhelms every other league, especially financially. For the 2013-2014 season, Bundesliga and Primera Liga respectively earned about six hundred billion KRW and nine hundred billion KRW each, while the EPL earned two trillion KRW. In addition to the financial area, hundreds of star players show the EPL’s strength. The famous English soccer player David Beckham once played in the EPL, and Christiano Ronaldo, a worldwide icon, also played there. Renowned Korean soccer players have also played in the league. Ji-sung Park, a lifelong captain and representative of the Korean soccer team, was in the EPL, and many future leading players like Heung-min Son, Sung-yeung Ki, and Chung-yong Lee are actively playing in the league now. For the British, soccer is always a part of their lives. It is the easiest and most popular leisure activity that the people enjoy. In parks, people playing soccer can always be easily found. In pubs, where British people spend a large portion of their free time, many love to watch soccer games while drinking and cheering together. On weekends, tons of soccer fans gather in stadiums to watch their favorite teams play. Even if their team has an away game, their fans travel to watch it. In England, every game is sold-out by fans, not just games featuring the most popular or successful teams. Stadiums are packed with people and overflow with energy. You may think that most audiences are male, but they are not. The British usually come to stadiums with their entire family, so there are also many female fans. Couples on a date can frequently be found, too. Even the chilly wind of England cannot freeze the fever of its soccer fans, as people take pleasure from being together to view the games while enjoying hot dogs and beer. What are the strengths of the EPL? The British, who are usually considered “stiff” and “prim,” are totally different when they enjoy soccer games. They are loud, active, and passionate. The stadium is a festive area where even the soccer-layperson can appreciate the sport together with the biggest of fans. Soccer, in Britain, is not a male-only sport. It is enjoyed by both male and female, young and old, and many differing social stratums. The people who love soccer are the steam engine of the EPL, and the EPL creates joy among these people. For this reason, the EPL truly has a role in improving British society for everyone.